Environmental stewardship must become a primary concern if management is to adequately fulfill its societal responsibilities. Management and accounting information systems must aggressively respond to these emerging requirements in order to support adequately the associated information needs as well as to design organizational systems that motivate and facilitate desired behavior. Our purpose here is to consider a framework useful for developing environmentally enlightening management and accounting information systems that take into account alternative environmental perspectives. The framework can be used to develop prototypes representing different levels of environmental enlightenment and, as such, can provide general guidance for moving collectives and organizations toward a more environmentally responsible posture. The framework is illustrated using an example from the salmon farming industry provided in Georgakopoulos and Thomson (2004). Dillard, J., Brown, D., & Marshall, R. (2005). 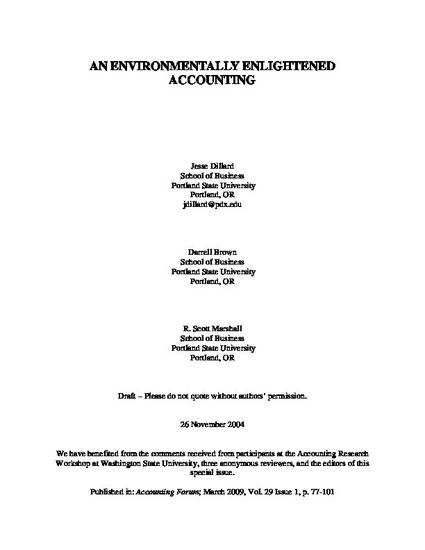 An environmentally enlightened accounting. Accounting Forum, 29(1), 77-101.